Phonographic Copyright (p) – Shadowplay Ltd.
Phonographic Copyright (p) – ООО "Шадоуплэй"
Made By – Shadowplay Ltd.
Made By – ООО "Шадоуплэй"
There is a position typo in the booklet: the written-by credits of track IV are introduced with the track position "VI". © 2005 - Darklands Records. ℗ 2005 - Shadowplay Ltd. Under the license from Darklands Records - Finland. ℗ 2005 - ООО «Шадоуплэй» по лицензии Darklands Records - Finland. Made in Russia by Shadowplay Ltd. Выпущено в России ООО «Шадоуплэй». For sales in the territory of Russia, Belarus, Ukraine only. Released in a clear-tray jewel case enclosed with an O-card; includes a 4-page booklet, no lyrics. Track IX "Open Your Eyes" was originally performed by [Invalid Artist] and appears on "The Lords Of The New Church". Track XI "King Volcano" was originally performed by Bauhaus and appears on "Burning From The Inside". 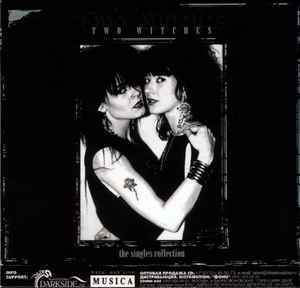 Matrix / Runout: SPR 009/2005 TWO WITCHES "THE SINGLES"